I saw textured backdrops being used by some photographers that I loved - Jan C Schlegel, Dayron Vera, Clay Cook and the most famous user of a backdrop like this of course, Irving Penn (his was used for over 50 years). I felt that they looked so much more raw and interesting than a normal paper backdrops that are available to buy. There is a character to them that adds to the photo in such a subtle way, but it is insanely effective. I had found some amazing companies making these kind of backdrops, one of my favourites is Unique Backdrops - however, as I am just starting out, they were a little out of my budget, so I decided to try and make my own! I have linked all photographers/companies I have just mentioned down below. Now I totally understand that the use of this will be completely different from what I usually do, but I just wanted to try my hand at it. I follow some absolutely amazing and inspiring portrait photographers who produce some stunning work - I wanted to see what I could do myself. There’s definitely nothing wrong with trying out areas of photography that you aren’t usually working in, it is all learning at the end of the day. Check out the images down below to see how I made one of these backdrops. I bought a 3m x 2m piece of canvas, white & black paint, a paint roller with a long handle (so I don’t walk on the canvas), and a sponge. My girlfriend, Ellie, who is a graphic designer suggested the sponge and it what the piece of kit that made the look of it so much better than if I had just tried to used a roller or a paintbrush. This suggestion along with some others of hers really made all the difference to making an amazing looking backdrop. 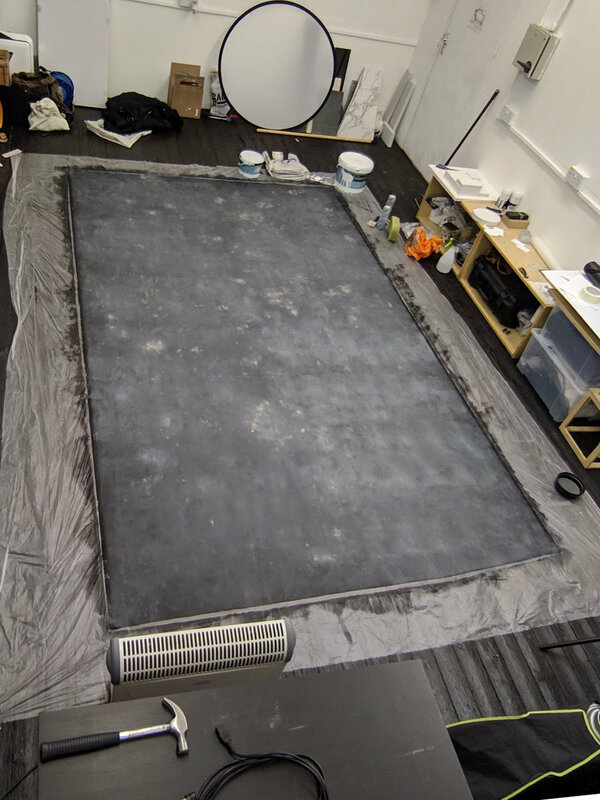 This is how it started out, just a 3m x 2m piece of primed canvas - really glad it fitted in my studio, I didn’t think of that before I bought it! 1 - First, I applied the darker tones and blended them together, there wasn’t much need to be ‘neat’ at this stage. 2 - I then painted a lighter layer on top and this was blended in too, evening out the tones a little. 3 - The next day, a much lighter after the other layers had dried properly - this was the exact look I was after, but it did take me over 2 hours for this one layer. 4 - I then darkened the edges do give it a natural vignette look. 5 - When it had dried the next day, I hung it up! It looks so good in my opinion and it is going to look amazing for any work with people in front of it. This backdrop turned out so much better than I was expecting - it will look amazing with some people in front of it. I will definitely be trying it out over the next week to see what I can do. I’ll probably post some results here! So, I realised that I didn’t explain why I decided to create these images on the last blog post, so here it is. Nearly three years ago, I developed the idea for this photo of photographing a watch movement in a technical way to make it look as if it has expanded when I used to sell watches that were more expensive than the average ‘everyday’ watch. One of the questions I was asked on a regular basis was ‘why is it so expensive?’. The answer was sometimes due to the materials (if there was gold included for example) but even if there was a precious material which added to the price, the answer was always because of how intricate and technical the movement was. 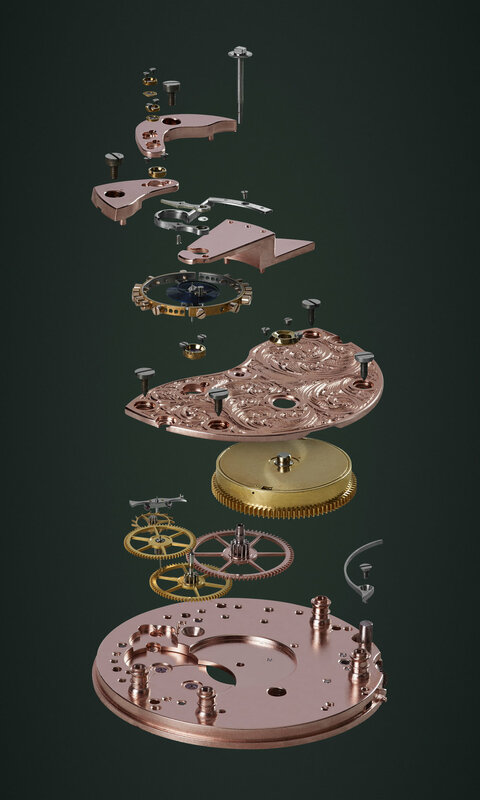 Unfortunately, with a lot of watches, the movement is hidden from the owner behind a metal case. Sometimes there is a glass back but even in this case, the whole movement can’t be seen. I wanted to provide an image of the movement in a way that allowed the buyer to see each component, but there was nothing available for me to do so. The response I have received from these images has been immense. Although I am not exactly sure how to make this grow, apart from doing more, a lot of comments from places I have posted these on have reinforced my ambition to make this something that is accessible to people - either for a education purpose when selling a watch or for an art installation for someone. I feel that these images have been a massive success and I plan to continue producing more images in a similar style. If anyone reads this and has an old, automatic/manual watch that they no longer want and wish to donate to me so I can do this with it, please do get in touch! 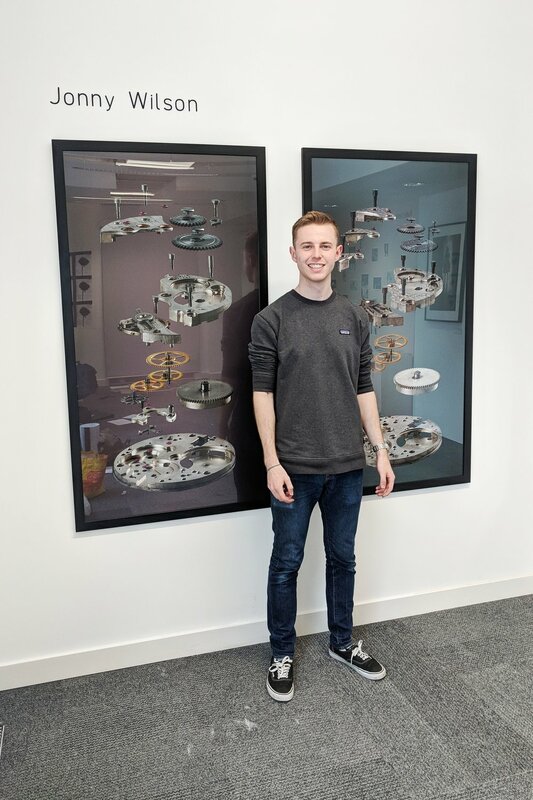 So my time at University studying photography is coming to an end. This time in 2 days and I will be finished. 'by the end of this course, you should be able to make a photograph, not take one'. I picked up my final images yesterday that I have made for this last hand in. The prevision of these images has been immense, ideas for how to do it have been going through my mind for over a year and a half. It was great to finally be able to make my vision into a reality. After seeing Andreas Gursky's work in London recently, I knew I wanted big prints. Okay they aren't as large as his, but these were about as large as I could afford! 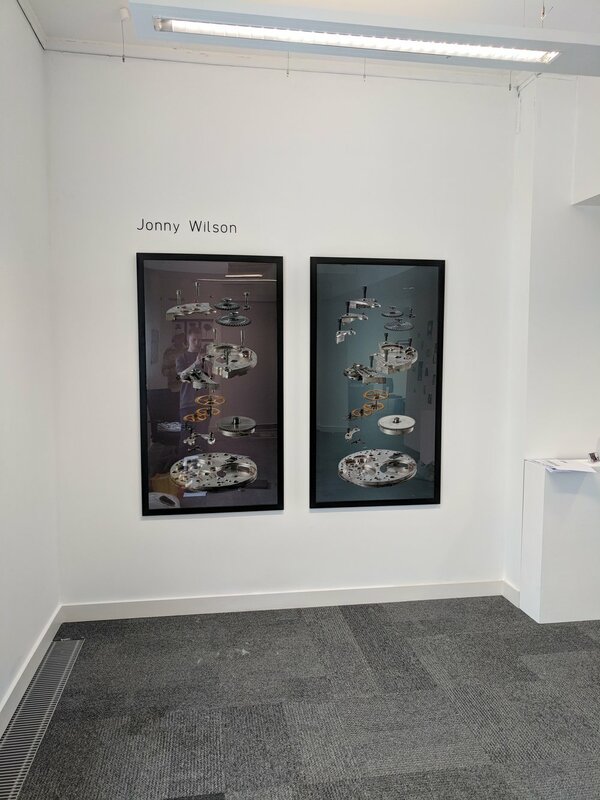 I couldn't be happier with how these images look hanging on the wall ready for my degree show coming up in my University. They are exactly how I imagined they would look and for this project certainly, I wouldn't change one thing about them. When I first entered there was a nasty, old, office looking grey carpet which I immediately tore up. Underneath was this amazing wooden floor. It needed a lot of cleaning but I spent a few days on it and got it to a point that I was happy with. I then brought in the kit I have been building up over the years. It is amazing for me that I am fortunate enough to be in this position at this stage of my career. It will benefit me hugely while finishing off my degree and photographing for my new small business, Horolograph. 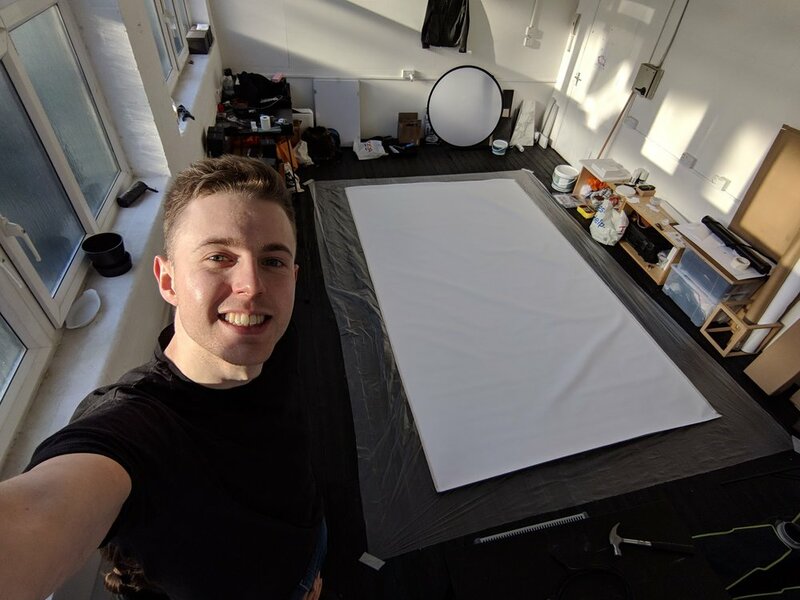 I then spent the next week painting the floor black and filling it up with the essential furniture that I needed, a desk, a table to shoot products on and some other small bits. It's also amazing how quickly it gets messy during a shoot.